New ARP Directory - a webwide radio list! 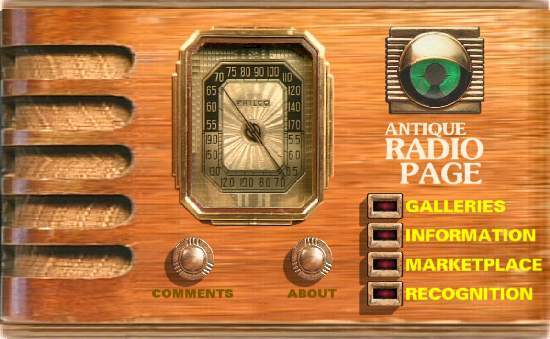 New in the Book Store - "Radios by Hallicrafters"
In the Galleries, see tube radios from the 20s to the 60s, transistor radios, related items, and novelty radios. Explore a bibliography of reference books, read interesting articles, and visit other sites at Information. And in the Marketplace, find out what's for sale, what others want to buy or trade, or place your own ad. Remember, almost every image at this site is linked to something, so click away and enjoy! Copyright © 1996, 1997 by Don Adamson. All Rights Reserved.